Since the first outbreak of Maya's allergies, I figured the importance of keeping a journal. 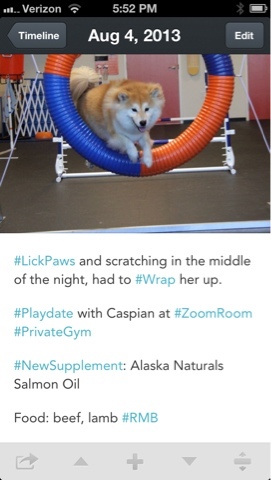 Not only to help determine what are the causes of her itchiness, but also to track what types of treatments are helping. I started this blog mainly for this reason. However, I soon realized a blog is a good way for periodical updates, but not as ideal for tracking everyday details. 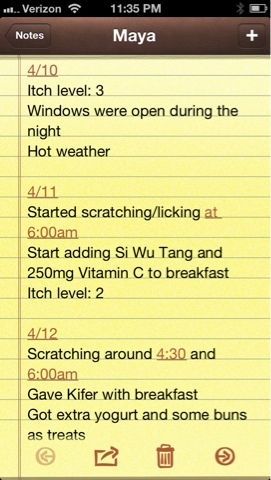 Maya's daddy and I soon came up with an idea of making our own iPhone app to track Maya's allergies. We can enter how itchy she is, what she eats, and what treatments she's getting; we can use the GPS to log her whereabouts and even look up the local weather automatically. Everything will be storing in a database and we can write some fancy data analysis program to find out how all those variables affect her itchiness. 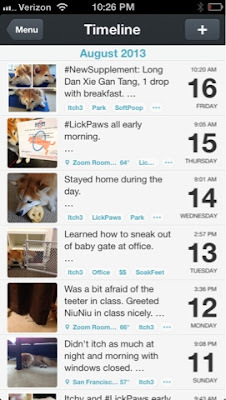 We can even sell the app and make a fortune from all those poor dog owners who are dealing with allergies like us. Well, this idea never got passed the design phase. And then almost two years went by, relying mostly on this blog, the pictures I took, and my memory, till we met Dr. M, who really impressed me by reading through my blog before we even met. During our first appointment, she emphasized the importance of keeping a detailed journal and wanted me to be more thorough. Without better options, I started to use the Notes app on my phone to write down anything I thought worth noting. However, it's really not the most pleasant input tool and within a week, I started to slack off. To get myself back on track, I decided to revive the "app" idea, but with easier execution. 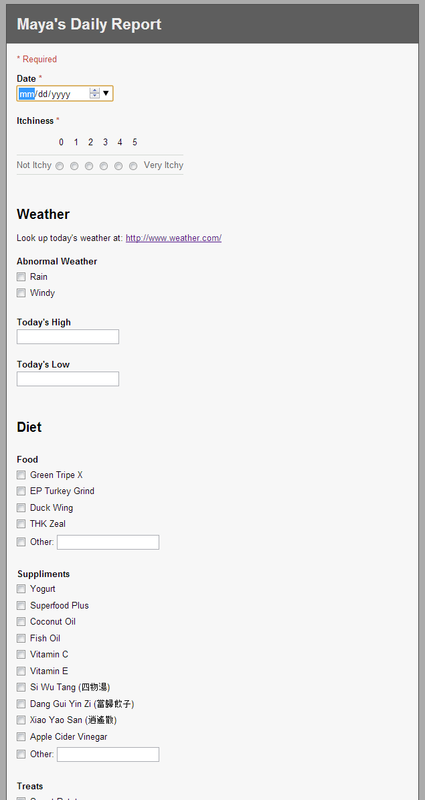 Instead of building a real app, I made a Google from document. With all of the information pre-entered, all I need to do is to go through the list and fill in the blanks everyday. It sounds neat and easy, but there are some serious flaws. The form once submitted, it's hard to make changes, so I need to fill it in the next day instead of throughout the day. Sometimes it's hard to remember all the details, even just 24 hours later. And if I do miss something and wanted to go back to make updates, it would be super difficult. 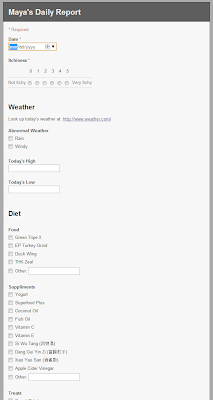 Moreover, if the pre-defined conditions changes, like adding a new supplement or new food, I would have to go edit the form itself before filling in. 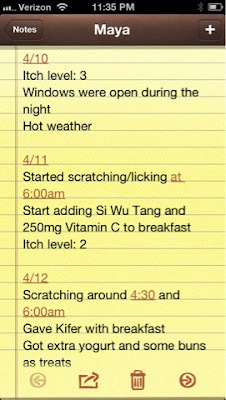 It is also hard to fill it out on the phone, so I have to make sure to get on a computer to enter this daily log. It felt too much like work, and I started to slack off again within days. After a few more weeks of feeling bad about myself, I decided to search if "there's an app for that" and found this app called "Day One". I was drawn by the nice interface and great reviews, so even though I rarely pay for apps besides games and this one is not on the cheap end, I made the leap of faith and paid for it. So far, I am very satisfied. Pictures: Everything looks better with pictures. Since I take pictures of Maya on my phone almost everyday, and we are dealing with hotspots, scratches, and infections, having pictures makes the journal much more complete. Tags: I can add tags for everything: food, location, activity, itch level, abnormal weather, etc. 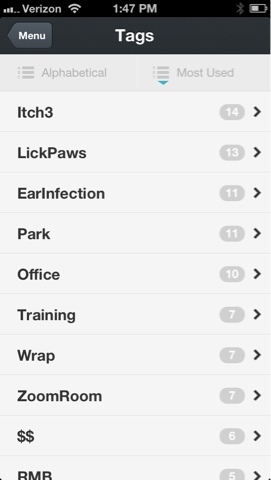 Tags make the entries much easier to search and organize. If one day, Maya's daddy decided to really write that "fancy data analysis program", we can probably still retrieve the information from the data. Backup: All data gets backed up to Dropbox right after editing. Backup is always an importation feature to me, since cell phones are so easy to lose. I also like that the data is stored in XML format, so if some day the developer no longer maintains the app, the raw data is still available. It can also export the entries to a nicely formatted PDF file, which makes it easier to preserve the information as well. Mobile: And of course since it's on my phone, it's always with me and I can make notes easily whenever I want. I can also keep editing the same entry throughout the day, or even days later, if I thought of something new. Each entry could only have one picture. On some days, only one picture is really not enough. I had to use other tools to combine multiple pictures into one. Each entry could only have one location. Some days we go to places. The weather entry will only get the weather data of the time of entry, not the range throughout the day. Since the temperature changes dramatically between day and night here, unless I retrieve the information from a fixed time every day, the data is not that helpful over the course of time. Can't have multiple "accounts". I would like to take some non-dog related notes myself, and would love to be able to use the same app. If some day I get another dog or even a real human baby, it would be nice to be able to keep a separate record as well. I've been using this app for almost a month now and still not tired of it. I wish I had found it much sooner. It would be great if I had a record like this since Maya's puppy days.